Posted on September 24th, by mad121704 in Published Articles. 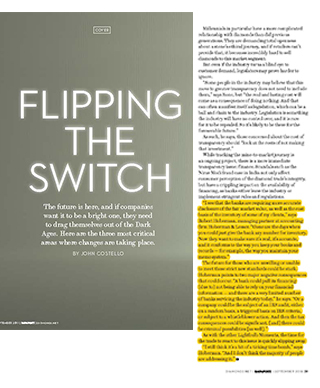 “Flipping the Switch,” article by John Costello, with a contribution by Robert Hoberman, was published in the September issue of Rapaport Magazine. The future is here, and if companies want it to be a bright one, they need to drag themselves out of the Dark Ages. Here are the three most critical areas where changes are taking place in the jewelry industry. Please see this article and Robert Hoberman’s quotes regarding the necessity for more accurate disclosure of the fair market value and the cost basis of inventory. Please contact Robert Hoberman with any questions.